Shirt dresses are popping up everywhere at the moment and I had one on my todo list for quite a while. When I saw the Chai dress from Kennis from Itch to Stitch I was sold and applied for the testing without second thought. The dress features a classic collar with collar stand, close fitting waist band, gathers insted of darts, a flared skirt and gathered sleeves. It has a classic, vintage inspired and very feminine look. I used a crinkle cotton, embroiderd with little flowers, that I had in my stash. I bought the fabric years ago on the fabric market in Hamburg. In order to avoid that the fabric would lost the shape I underlined it with a cotton batiste. Usually I have a big stash of white cotton batiste, as this is my preferred lining/underlining, but I just had enough for this dress. I even had to piece the fabric for the skirt and the sleeves. Ever since reading that article in Threads about piecing to save fabric, I try to incorporathe this technique into my sewing, and it works quite well. For the piping, inner collar stand and fabric coverd buttons I used scraps of a ruby colored cotton. The color is very close to the darker flowers of the crinkle fabric. Usually for Itch-to-stitch patterns I use a size 2 for the bodice and size 4 for the hips. Kennis encouraged us to remeasure ourselves and choose the size according to our measurements. This put me to a size 0 for the waist. I was a bit afraid that this might be too tight, but the muslin turned out ok. The waist is designed to have a tight fit. If you do not like this, you should consider to go up one size. I had to do a small bust alteration. Even as the pattern comes with different cup sizes, the A cup was still too big on me. 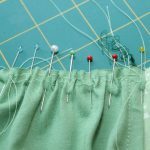 As the front bodice does not have darts, but gathers, I consulted my Craftsy class “Adjust the bust” how to make a SBA for a bodice without darts. In the process the front armhole is decreased a bit, but I thought I could get away with that. After the first wear it turned out, that the armholes are a bit tight, but still ok. I was quite happy with my muslin after these alteration and started sewing the dress. As I am a bit paranoid about fit, I always try on my makes during sewing. So I did after attaching the waistband to the bodice and somehow felt unhappy. The bodice wanted to ride up and there was still too much fabric below the bust. I decided to follow the demands of the fabric and shortened the bodice by taking out 1 cm at the shoulder seams. The whole thing immediately felt so much more comfortable and the ease created by the gathers was now across my bust and not below. This is, of course, a quick and dirty fix, but I was not in the mood of unpicking the waistband with my already trimmed and graded seam allowances. This alteration made the neckline opening smaller too, and I had to change the collar pieces accordingly. I am not able to close the collar, but I would not do that anyway. As always the instructions that come with the pattern are very thorough and we had some testers that did their first collar with collar stand with great results. For the bodice I used french seams and was tempted to do so also for the skirt. 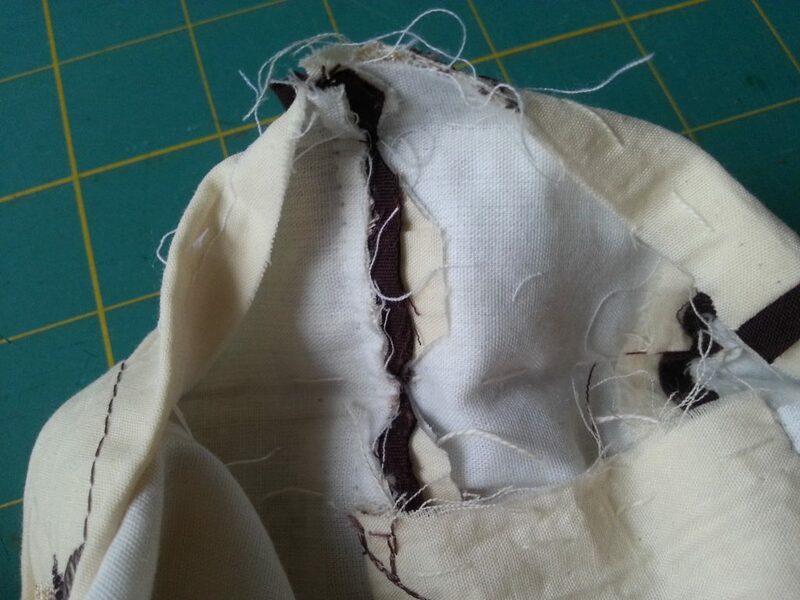 I have never made in-seam pockets with french seams, and although I found a good tutorial, I was afraid that time would run out and I decided to go the safer way and just serged the seam allowances. I handstiched the inner waistband to the skirt as well as the inner collar stand (I am still not able to do a proper stitch in the ditch, and I love handstitching. It makes me feel more connected to my garments). For the piping I cut a 3.5 cm wide strip on the crossgrain. I did not cut on the bias due to fabric limitation. As the waist seam is not curved, I decided this would be ok, and it is. The piping added a lot of bulk where the button placket is turned to the inside. I trimmed as much as I dared at the fold lines. This is a great pattern, and probably not my last make of it. I can also imagine it with a more gathered or circle skirt. This pattern offers a lot of possibilities. Check out all the testers’ versions here. This is so pretty! I agree with you about “Stitch in the ditch” It’s definitely a tricky one, and I hand stitched, too. I love this version. Beautiful! What a lovely dress. It fits you so well and is very flattering. I especially like the piping. I like reading about how you made that length adjustment on the fly! It’s good to listen to your fabric, and lucky that you needed less and not more 😉 The dress looks fantastic on you!